And her necklace is just great! I love it! I initially had some trouble with the coat being so much longer than the dress, and the boots seemed a bit off in this outfit, but the more I see this shot, the more I like it. @Cecillia: For Fall, she is a bit early. But I did notice at the Autumn Winter shows of last week that tan was an extremely popular color. We’ll probably see a lot of it this Fall! @NucleolusEgoist: Yes, we should show more girlish fashion, I guess… Will work on it! I love her simpleness! and fresh and nurd colors are really hot this season. I liked this shot, and “dress shorter then jacket” doesn’t make a serious matter, moreover, they’re matching. also, her hair looks so good with a dress like this, i should say. “I want a girl with a short skirt and a looooong jacket!” The tiny florals make me glad spring (would be) just around the corner, and the boots are giving it a little edge. @Petite Sam: It is especially the tiny florals that manage to give her a soft feminine look, don’t you think? And the boots definitely add the edge, as you say. My cosh, she looks like a candy! she’s adorable…as well as the outfit! She looks so beautiful!! Love!! wow, she’s gorgeous, that dress is lovely. 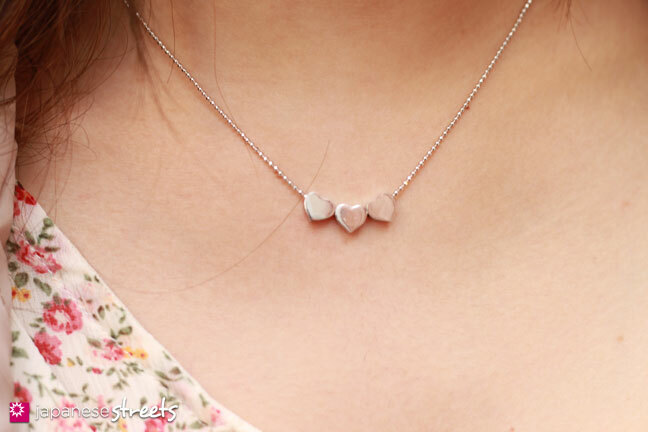 the necklace is really cute too.